Next time you’re a passenger in a car, stick your hand out of the window. I don’t care if it’s a bit cold outside, but I do care if it’s raining or snowing. You need to be able to tolerate having your hand out there in the breeze for about a minute or so. Hold your hand as flat as you can, like you’re doing a karate chop. Make sure the palm is down, and the fingers are pointing straight at the horizon. It’ll help a lot if you say out loud, or even think to yourself “Weeeeeee!”, while you’re doing this, then you’ll hold your hand like I have in mind: like a little stubby wing. So this game -‘cos I ain’t gonna call it an experiment, that’s what asexual nerds in labs with white coats do- is going to work best if the car has a reasonable speed, because you need to feel the push of the wind on your hand. Walking pace ain’t going to do much for you, in the same way that going so fast that you’re in fear of your life may also pull your attention from the aim of the game. If you’re going to push me for a number, I’ll say that any out-of town legal cruising speed will work. Start with your hand totally flat, so the thumb gets really cold, because it’s the part of your hand hitting the air first. Feel how much you’re having to strain your arm to stop the wind blowing it backwards. Take a mental note of that. Quickly turn your hand so that it’s palm-on to the wind, in other words you’re now karate-chopping downwards towards the road, with the thumb up. If I’m right and you’re driving through the regular air of this planet and your driver hasn’t stopped at a red light, the moment your hand gets to the vertical, you’ll feel it getting pushed back, hard. You’ll need a lot more effort to hold it against the airstream. Not working for you? Ok. Try opening the car window and starting again. So why? Well, it’s easy. 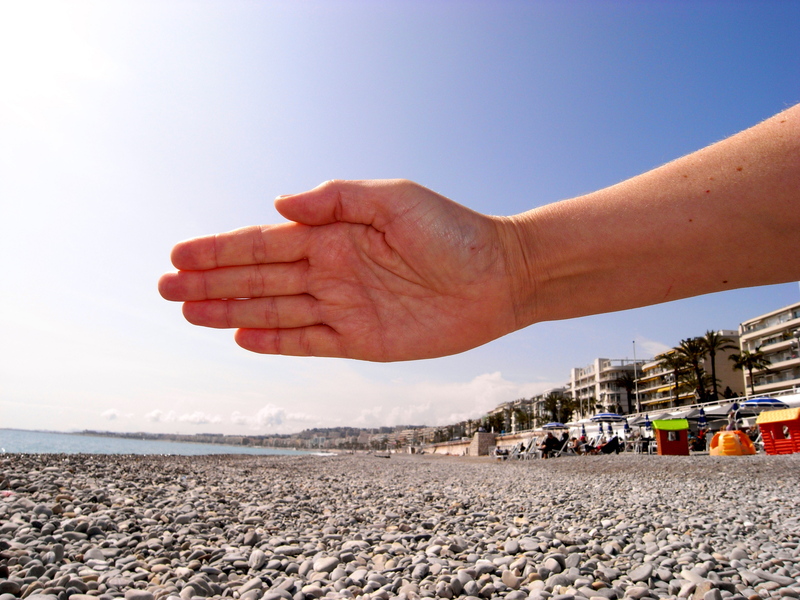 Your hand has a lot more drag when you place it palm-on to the wind. That’s why when you push a door with your hand, you use the palm, not the fingertips. If you pushed with your fingertips, all the push would be in one much smaller place and gosh, that’d hurt. Your hand has more drag flat-on simple because it’s bigger. Go outside on a sunny day, look at the shadow of your karate-chop weapon and it’ll look like a long, thin thing, maybe like a long finger. Make the stop! sign with your hand, sun beaming onto the back, and now look at the shadow. Much bigger, like an elephant’s footprint, or a freshly-baked keema naan. That’s drag dealt with. Big stuff is more draggy than small stuff. Any questions? No, I didn’t think so, ‘cos life is a lot easier when you get rid of the equations and numbers and work out how stuff works by feel. I mean, why not? As young children, we learn by feel, gauging the weight, bounce and heft of things, so why not use the same principle in flying? Let’s get to the meat of this. Start again the same way, moving at a good lick in the car, with your arm out and the palm down, in what I’ll call ‘low-drag’ position. Again, take a mental note of the amount of push you have to do to stop your hand flying backwards. This time, turn your hand very slowly, moving the thumb towards the top. The motion will be like very slowly turning up the volume on your Marshall amp. Feel the force. It will ramp up, then suddenly, whump! It’ll get a lot bigger and your hand will try to fly backwards. Ok, try it again, but this time try to tilt is as much as you can without getting the whump! effect. You’ll even be able to fly your hand up and down by tilting it up and down, and as long as you don’t go too far, the wind won’t try to whip your hand back. So what’s happening? While you keep the angle of your hand low, the air can sneak over the top. Twist it too far, making it just that little bit too flat against the wind, and the air can’t sneak over the top any more: the angle’s too sharp. Whump! All the air hits the palm and all the force pushes your hand back. After a few minutes of trying, you’ll find an angle beyond which you can’t go without the air whipping your hand back. Congratulations, cold-handed, ringing-eared person: you’ve just discovered something called Angle of Attack. Why’s it important? 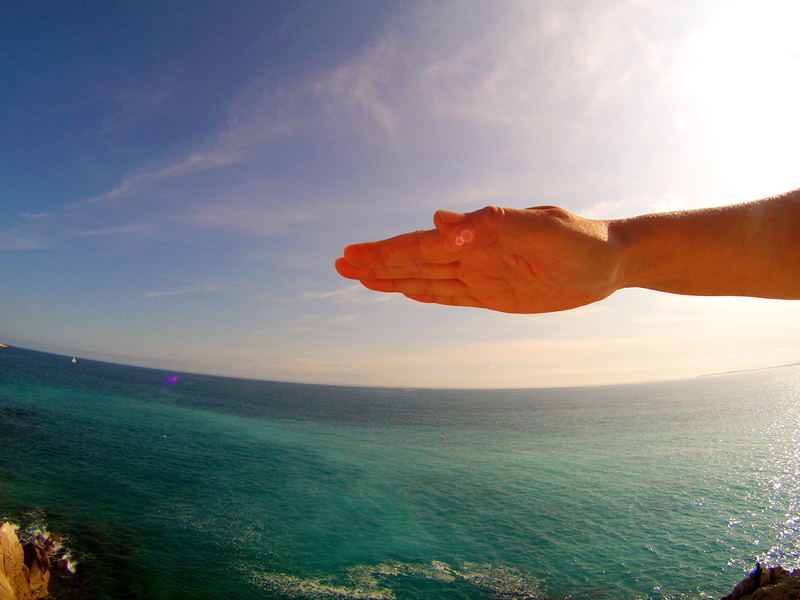 Your wing is a big hand, thumb-on to the air as you fly. Pull the brakes and you’re tilting the back edge down, just as you did with your hand. Pull too hard, and whump! the air hits you hard and ain’t going over the top of your wing any more. It’s called a stall. Best to avoid them, eh?